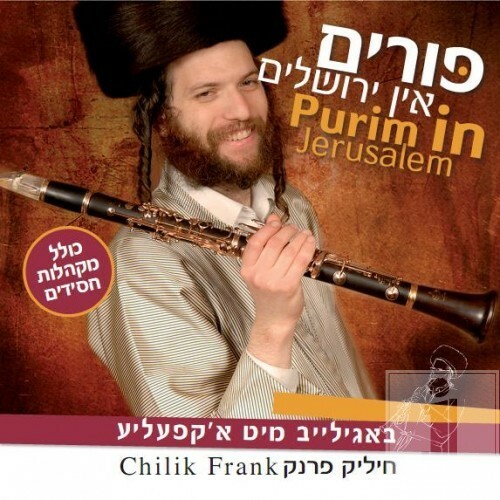 One of the artists that just don’t stop, is Yerushalmi Klezmer artists Chilik Frank. A few months ago he won first place at a Festival in Amsterdam for his composition with Naor Carmi called “HaLev V’HaMayan”, and now he is releasing an a new album that lively aptly named “Purim B’Yerushalayim”. Chilik Frank, a young yeshiva student, barely 30, already has 10 albums to his name. In order to understand his secret one must go up to Meiron on the Yahrzheit of Moshe Rabbeinu (Zayin Adar) and watch him closely. Chilik Frank finds it beneficial to connect with the old niggunim by davening with them in a beautiful natural setting that leaves him with a deep sense of devotion. Perhaps this is the reason why he is the only one who managed to cross each sector and is welcome to play at many weddings, public – national events, even folkloric performances in the Tel Aviv Museum. As well as dancing and singing all night at the Simchat Beit Hashoaiva of Toldos Aharon. After two years of a more general audience appeal with the song “HaLev V’HaMayan”, he now returns toa more specific one. A month ago, he entered the studio of producer and arranger Jeff Horvitch. His defined goal was to bring the joy of Purim in Jerusalem to every home Israel. Recruited to help work are violinist Oren Tsur, Menachem Herman and other guitarist artists and friends. The result – a real celebration of Purim In Jerusalem. The album is divided into several long strings: The first strings are all Purim songs, other strings include exciting melodies based mainly on the chasidus Breslov and Chabad. This album is the first of a series for the holidays, a series with a special surprise: Each album comes out in two versions: Standard klezmer version – instrumental, and full-length version of songs performed by a chorus of Chasidim giving it an authentic feel.